I'm rather taken with this blogging lark so I'm back with another guest post, this time on my favourite accessory ever - sunglasses! A lot of sunglasses are unisex and I happen to think these styles look just as good on both sexes. Now you may think that once the summer months are over and the nights start drawing in then it’s time to put those sunglasses away and bring out the ski goggles. Well, you think wrong! While the sun may not be so bright it is lower in the sky and as such, on those few days that it’s not raining, shades are essential for the avoidance of immediate blindness. And of course they make you look cool, see my new photo above, but those old Ray-Bans have been on my face a good while now so it’s about time I updated. ONE I’ve never been lucky enough to own a pair of the iconic aviators and while there’s many modern takes on the original these Classic Silver Mirrors (£120) are still top of my wish list. TWO If those are a little too rich for your blood you don't have to stick to Ray-Bans to get a similar style. I also really like these ones from Zara which are just €19.95. 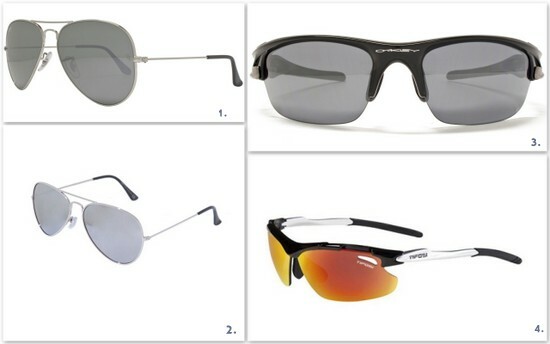 THREE For the more active amongst you the first choice for sports sunglasses has to be Oakley and for me the best for using in unpredictable weather conditions would be the Fast Jackets with their fantastic interchangeable lens system. These are £155. FOUR You may not want to spend so much on sunglasses which could at any point be smashed in a horrific cycling accident or end up sinking to the bottom of a river. If that’s the case then I recommend taking a look at Italian designer Tifosi, I use their ‘Tyrant’ model (which you can find on Amazon from £43). FIVE But if you think my choices are maybe a bit conservative then perhaps you might consider making a statement with these ones from ASOS! They were €17.06 but are now in the sale for €13.51. And yes, they are her glasses. Do you think I can carry them off? Oh and if you're really smashed and can't stretch to any of these suggestions how about a free pair from Firmoo? Check out this post for all the deets. Great post! You already know what a fan of sunglasses I am!!! Great job Mr. Fluff! I love #1 and #3! I've been hearing a lot about Firmoo. Nice! Thanks so much Eadaoin - congrats to you too, though with your beautiful blog I never doubted it for a second! Sadly I fly out to Spain the morning of the awards - it's such a pity as I'd have loved to have met up with everyone! This is an awesome post! I can't wait to see more posts from Mr. Fluff he always has a great perspective. These sunnies looked great on him. Love this post! We need more Mr Fluffs to share about fashion. Hope you'll post again soon!